and repair of Navy hulls and hull appendages while the hulls are waterborne. UWSH includes tasks such as patching, plugging, attaching cofferdams, waterborne hull cleaning, underwater weld repair to ship's hulls and appendages, propeller replacement, underwater hull inspection, and nondestructive testing (Figure 6-1). 6-4.1.1 Objective of UWSH Operations. The objective of all UWSH operations is to provide a permanent repair without drydocking the ship. When a permanent repair is not possible, temporary repairs are performed to allow the ship to operate until its next scheduled drydocking where permanent repairs can be accomplished. 6-4.1.2 Repair Requirements. All UWSH repairs shall follow strict Quality Assurance (QA) procedures to ensure underwater systems are properly repaired. Divers shall work closely with all other repair activities to ensure procedures comply with prescribed ship design and maintenance specifications. All relevant technical manuals shall be made available for dive planning, and individual diver background and expertise shall be considered when assembling dive teams. The NAVSEA Underwater Ship Husbandry Manual (S0600-AA-PRO-010) provides general guidance and specific procedures to accomplish many underwater repairs. Figure 6-1. Underwater Ship Husbandry Diving. 6-4.1.4 Training Program Requirements. A proper training program should result in permanent repairs meeting the same tolerances and QA requirements as if performed in drydock. If there are any questions as to the qualifications required for a permanent repair, divers should consult with their command repair department or contact NAVSEA 00C5. 6-4.2 Salvage/Object Recovery. In a salvage or object-recovery operation, divers work to recover sunken or wrecked naval craft, submersibles, downed aircraft, human remains, or critical items of equipment to help determine the cause of a mishap. Salvaged items may include classified or sensitive materials (Figure 6-2). 6-4.3 Search Missions. Underwater searches are conducted to locate underwater objects or subsurface geological formations. Searches can be performed by various methods depending on the undersea terrain and purpose of the mission. Because using divers for an unaided visual search over a large area is time consuming and labor intensive, this type of search operation should incorporate the use of sidescan sonar and other search equipment whenever possible. Remotely Operated Vehicles (ROVs) may be used to extend searches into deep waters and areas that are particularly dangerous for a diver. 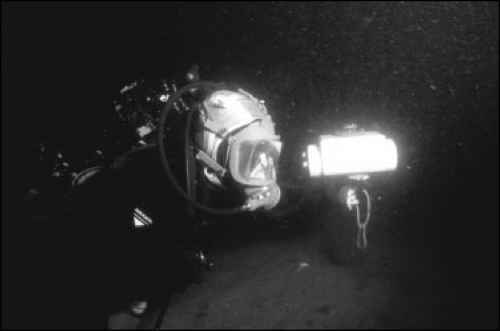 A reconnaissance dive may be conducted prior to other scheduled dives to gather information that can save in-water time and identify any special hazards of the dive mission. 6-4.4 Security Swims. Security swims are employed to search for underwater explo sives or other devices that may have been attached to ships or piers. Ship security swims for ordnance may be conducted by non-Explosive Ordnance Disposal (EOD) divers only to locate the ordnance. Only EOD divers shall attempt to handle or dispose of underwater ordnance or improvised explosive devices. Once a task is identified as involving ordnance disposal, the area shall be marked, EOD support requested, and all personnel warned to avoid contact with the ordnance. 6-4.5 Explosive Ordnance Disposal. Divers perform Explosive Ordnance Disposal tasks including recovering, identifying, disarming, and disposing of explosive devices that must be cleared from harbors, ships, and sea lanes (Figure 6-3). 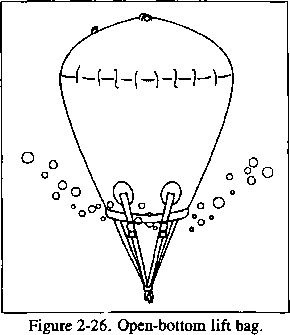 Diving in the vicinity of ordnance combines the risks of diving and the explosive hazards of the ordnance. Diving to investigate, render safe, or dispose of explosive ordnance found underwater, regardless of type or fusing, shall be accomplished by qualified EOD divers only. 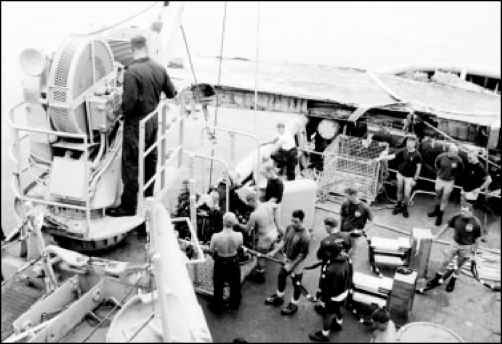 Ship security searches for limpet mines or improvised explosive devices may be conducted by non-EOD divers for the purposes of location only (see paragraph 6-4.4). Only EOD divers shall attempt to render safe underwater ordnance or improvised explosive devices. Refer to Chapter 17 for more information on EOD operations. Figure 6-2. Salvage Diving. Surface-supplied divers on an aircraft recovery mission. Figure 6-3. Explosive Ordnance Disposal Diving. 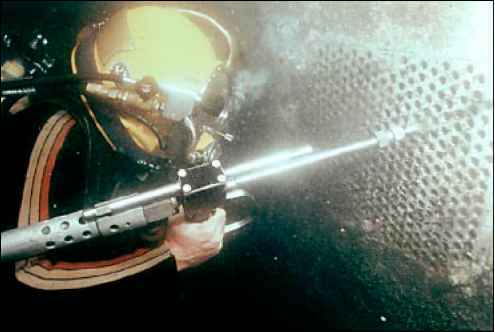 An EOD diver using handheld sonar to locate objects underwater. 6-4.6 Underwater Construction. Underwater construction is the construction, inspec tion, repair, and removal of in-water facilities in support of military operations. An in-water facility can be defined as a fixed harbor, waterfront, or ocean structure located in or near the ocean. Pipelines, cables, sensor systems, and fixed/ advanced-base structures are examples of in-water facilities (Figure 6-4). 6-4.6.1 Diver Training and Qualification Requirements. Seabee divers are specifically trained in the special techniques used to accomplish underwater construction tasks. 6-4.6.2 Equipment Requirements. Tools and equipment used include common underwater tools in addition to specialized ocean construction equipment. Specific tools and components for large ocean engineering projects are maintained in the Ocean Construction Equipment Inventory (OCEI) located at St. Julian Creek, Norfolk, Virginia. For more information on ocean construction, commands should consult NAVFAC Ocean Facilities Program.